Its amazing how many people still think they get a fair shake from the mainstream news media. If you’re one of those, then stop reading right now, because you’re never going to agree with my hypothesis on Sarah Palin and the Couric interview. For those with a more realistic view, stick with me. Sarah Palin is widely hated only because the mainstream media have steadily waged war against her at the direction of their Democrat masters. It began when she walked on stage to give her speech as the Vice Presidential candidate. Media Democrats were floored by her presence, and frightened, and right there started plotting a neutralizing strategy, as the later discovered emails from “Journolist” proved. That offensive has continued right up to today, with its most recent barrage being fired over the Arizona shootings. If anyone ever harboured any doubts over the media’s partisan hatred of Sarah Palin, then those doubts must have vanished after that shameful and cowardly display of naked propaganda that attempted to blame her for the Tucson tragedy. Back in the election campaign of 2008, the first real fusillades were fired from mainstream commentators like Katie Couric and Charlie Gibson. Since the most destructive Democrat inspired meme against Mrs Palin has been the Couric interview, I’ll only deal with that. In the first place Couric is a Democrat who is never going to possess the means to understand a Conservative viewpoint. Objectivity in reporting must take second place to her noble mission to maintain the left’s control of the political paradigm. So she was never going to give Palin a fair go. In fact, in an unprofessional breach of journalistic ethics, Couric sought advice from Democrat strategist Sam Nunn as to what she could ask Mrs Palin in order to help with the demolition the Journolisters had already decreed necessary. They even decided that they would not refer to her as Governor, although they had often done so with Democrat interviewees. For example calling Joe Biden “Senator”. The two of them (Couric and Sam Nunn) discussed not just the content of the interview, but actual tactics. By Couric’s own account, they plotted both what to ask, and how to ask Governor Palin certain foreign policy questions. Does that sound like a fair-minded journalist to you? It’s strange that the thought apparently never occurred to either of these “brilliant” Progressives that John McCain was the foreign policy ace on the McCain/Palin ticket. Did Couric study up on Governor Palin’s views on energy independence and ask her what we can do to tap our resources responsibly and ethically based on the governor’s extensive experience in that area? Did she research Palin’s own written statements and abundant interviews prior to her VP call up? Did she once show any curiosity about why Governor Palin had a 90% approval rating in her state or how she had earned her reputation as a fearless Alaskan reformer? As she would have had Sarah been a Democrat. No, she asked Mrs. Palin a series of ‘gotcha’ questions over a period of several days and then cut and sliced that six hours of footage back to a 20 minute interview designed to make Sarah look as bad as possible. Couric made a mockery of the interview process by asking irrelevant questions fueled by an obvious liberal agenda. Her intent, as her meetings with the Democrat strategist had decided, was to paint Palin as uninformed and provincial. Who else in America, for instance, believed John McCain’s efforts to reform Fannie Mae were meaningless to the discussion? Yet Katie Couric insisted that Palin specifically name other instances in which McCain called for increased regulation. Why else would you include Palin’s brush off non-sequitur about her reading habits? And why did Palin give her that brush off? In her book, Sarah said Katie had already tried her patience with endless gotcha questions and by that time she had just had quite enough of her. 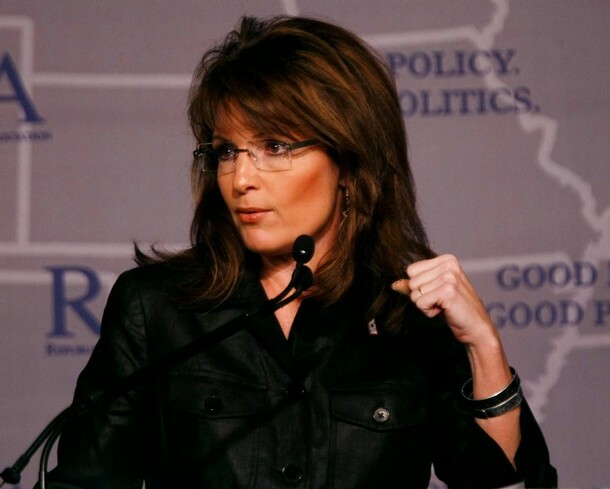 (Palin had been set up by a McCain aide, Nicolle Wallace, a close pal and former employee of Couric, who arranged the interview and told her it would only be 30 minutes) Mrs Palin writes how Couric continually badgered her and then edited out her substantive remarks in favour of a few weak responses to some gotcha questions. After the interview, the same Democrat media that later engineered the false blame for the Arizona shootings blasted off carrying another payload for Obama. They carried on where Couric had left off and panned Mrs Palin’s performance again and again and again and again and again until finally the lie became fact in the minds of the public, or a useful meme able to be used against her by her political enemies. In fact the Couric interview did not go that badly for Palin. Even after the grossly unfair and biaised editing process, the slights against Sarah are more just vulgar insults than anything else. To even remotely believe that a State Governor doesn’t read, or have any understanding of the world is just slander, and nasty childish slander at that. As the website Conservatives4Palin states- Couric has made a career of pandering to the absolute lowest, crudest, nastiest level of liberal female bitchiness. To judge Palin’s accomplishments by her crude insults, and her grotesquely obvious and openly malicious bias, is absurd. Palin’s only real mistake was deigning to talk to the conniving fake in the first place. And on that I will criticise Mrs Palin. She should have known that Couric was a Democrat plant out to do her evil. Sarah went into the interview not knowing who Couric was and attempted to be candid and frank and sincere but by the time the interview had closed and she was leaving, (which was when she was asked about her reading habits), she had awoken to what a fraud Couric was and had had more than enough. Still, a fully aware politician should have known in advance that Couric was a fraud. A fully aware politician would not have been so easily led by Couric’s cronies on the McCain team. Sarah Palin knows it now. The claim that Sarah Plain is “stupid” and that the Couric interview proves it is just another creation of the Democrat propaganda machine. What the interview did prove, through the fakery of its execution and the wave of smears that followed it is that Katie Couric is a partisan fraud and that the media are corrupt scum, carrying water for the Democrats. The oil company executives Palin out-maneuvered in Alaska know she is not stupid. The Alaskan Republican Party Old Boy network that was decimated by Palin knows she is not stupid. The only people who persist with this weak fake partisan myth are the damn head in the sand fools who still believe the mainstream media brings them objective news. Earlier Monday I came up with a new uniquely American name for the Fourth Estate. They have now been totally absorbed by the First Estate and cannot in anyway be considered to be independent of those in power. The Administry of Lies fits those agents working for the Statists. And I really don’t care if anybody else follows suit. I volunteer to be the odd man out if need be. I’ve resigned myself to avoid any more sarcasm, any more euphemism, any more Orwellian terms like Minitrue when referring to MSM. The Administry of Lies has become my choice for referring to these rotters until someone comes up with something better. The term seems to be the most accurate assessment of what they have been doing. Whether they are slamming Palin so they can personalize the opposition to them — and to give their slobbering followers their daily two-minutes hate, or if they are deliberately setting her up as the next opposition candidate as they did with McCain, and even GWB before him, I do not care. They are carrying the lies, lies, and more lies for unclean interests. They administer lies whenever, wherever, and against whomever they are needed. I know you don’t normally like my word creations RB, but I thought I ought to tell you given how pissed off at how heavily invested in behaving like the old Pravda they have become. That is not true. I see them as an amusing and creative way of dealing with a difficult problem. Whoever “Outside Observer” was, he’s more than welcome to try and explain to me what he meant. Despite his being marked by RB as an unwelcome troll, if he really thinks that all in power are to the Right, I’d like to hear his explanation over at my blog. That’s it you see Pascal. His comment was totally content-less. If he wanted to make an argument he could have, but it was no such thing. Just a worthless assertion not even on the topic of Couric’s deceit and deception. I just do not have the patience for dealing with such worthless juvenile utterances from such brain dead people. Sadly, I know what you mean. I’ve seen the troll-bots spew out all sorts out of sync comment. It certainly clear now that I am reminded what this old thread was about that his comment was a non-sequitur. Good call RB.